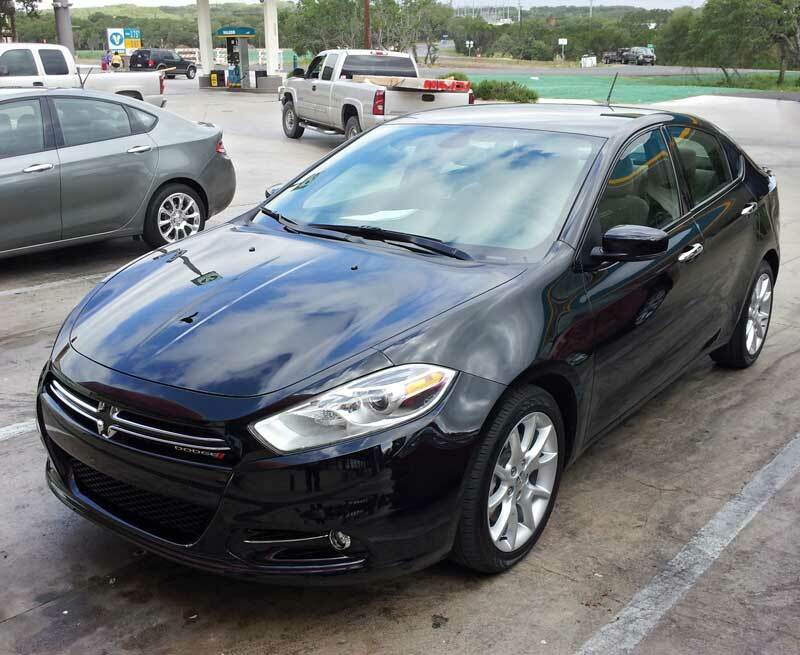 So here I am in Austin, Texas at the launch of the 2013 Dodge Dart. There's a lot to talk about regarding this car, as it's Chrysler's latest foray into the compact C-segment class—a hyper-competitive genre that is growing incredibly fast. In fact, Dodge says that the compact car segment is the fastest growing of any group of cars on sale in the U.S.
You probably remember the Dodge Neon. Chrysler sold boatloads of them. But for 2007, there was no more Neon. Instead, Dodge launched the Caliber, a car that was almost universally panned by the automotive press as well as most consumers. Now that the Caliber is in its last model year, the Dart (thankfully) ushers in a new chapter in Chrysler's C-segment; one that I think will be much more loved. Based on Alfa Romeo underpinnings, I'm venturing to say the Dart is going to be the best small car Dodge has ever offered. From its three powertrains and transmissions, various trim levels, attractive styling, and multiple performance variants, there will be something for all compact sedan buyers that turn to Dodge for their vehicle. Today, we had the ride and drive portion of the launch, which took us through Texas hill country so we could get an idea of what the new Dart is like in the wild. We were able to drive were a mix of cars with the 2.0-liter naturally aspirated Tigershark engine (160hp/148 ft./lbs. 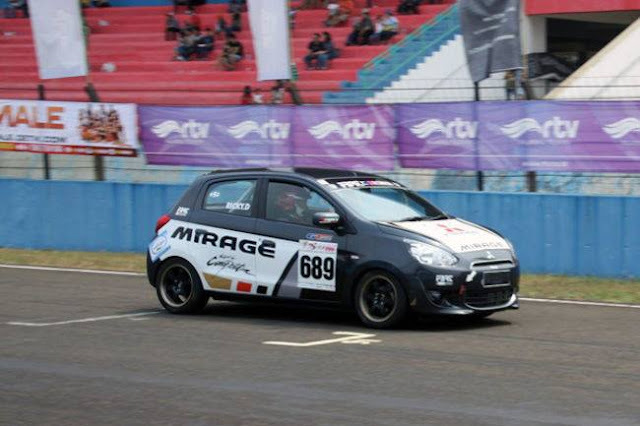 torque) and 1.4-liter turbocharged MultiAir (160hp/184 ft./lbs. 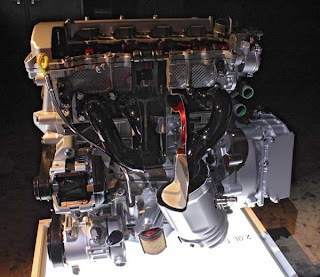 of torque) engine. There were automatics and manuals to sample, as well as a number of trim levels. I've previously talked about the Dart's looks when I saw it at the Portland International Auto Show, so I won't go into details. You can decide for yourself. First up was a black Dart Limited with the 2.0-liter engine and the six-speed 6F24 automatic transmission. 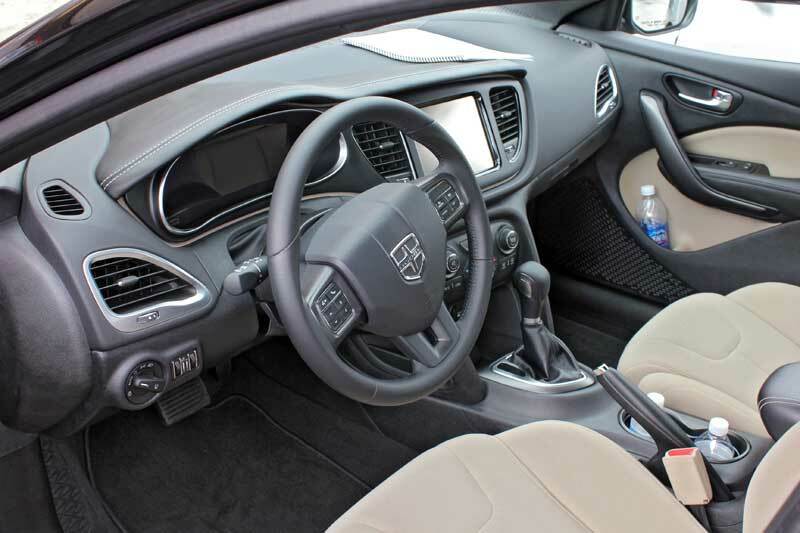 The Limited trim level's interior looks downright great. There's soft-touch dash textures, stitched leather bits, and a handsome black/tan color scheme. The seats are well bolstered, supportive, and comfortable. The power driver's seat allows for lots of adjustments, and the tilt/telescoping wheel lets you get in the just-right driving position. Ergonomics seemed good, and there's a healthy helping of touchscreen technology. Radio, climate control, navigation, etc., are all controlled/displayed via the car's 8.4" Uconnect touch-screen. And if that wasn't enough, the car also uses a 7" LCD gauge cluster which displays an analog speedometer, although the tachometer is a real dial with a genuine sweeping needle. There are a number of display options for this gauge cluster, although I didn't have a chance to futz around with them. I can say it was easy to read, and I was impressed by the ultra-smooth motion of the digital speedometer dial. It's better than I expected. A great notable and very convenient feature is the under-seats storage found on the Dart. The passenger's seat bottom flips forward to reveal a compartment—great idea for an underutilized area. The Limited model also includes LED interior lighting, automatic headlights, active aero grille shutters, and underbody aerodynamics. 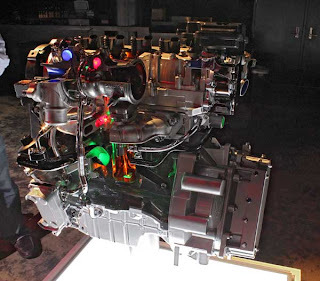 A cutaway of the 2.0-liter Tigershark engine. The 2.0-liter Tigershark engine isn't exactly a rocket ship, especially when mated to the automatic transmission. However, it's also the base engine. That's not to say the car is extremely pokey, but it's not warp speed, either. I found it required a heavy foot to keep the car motivated in the hills (and with the A/C on). Fuel economy ratings for this engine/transmission combo weren't available, but when paired with a manual trans, the EPA estimates are 29 city and 36 highway. What was quite admirable, however, was the ride and handling. 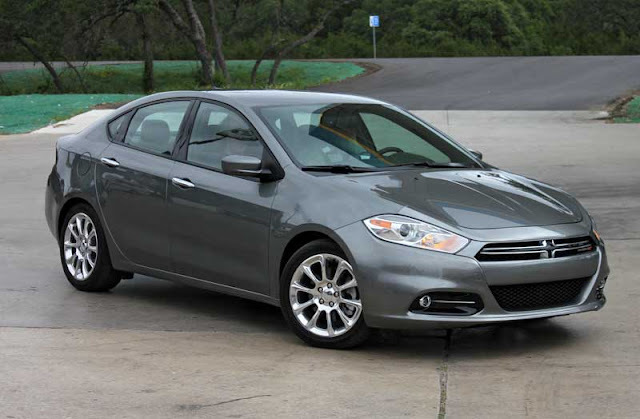 On the highway, the Dart offers a comfortable, composed, quiet ride. In the corners, the Dart's chassis is very willing. Steering feel and weight is excellent, and the car feels planted and secure. The four-wheel disc brakes are very grippy, and provided plenty of stopping power. By the way, four-wheel disc brakes are standard on all Darts. The Tigershark-equipped Dart will likely be the volume seller, and so long as you're not looking to win many stoplight drag races, it's quite competent. Based on the driving experience and interior alone, I think its got much more character than Honda's latest Civic sedan. Next up was a red Dodge Dart SXT with the 1.4-liter turbo MultiAir engine. This Fiat-sourced mill was equipped with the company's six-speed manual. A dual dry clutch transmission (DDCT) will be optional. By the way, it looked essentially the same as the black car above, sans the paint. From the get go, this engine is definitely more willing to make power, and the additional 37 ft./lbs. of torque is very evident. The car pulls strongly from around 3,500 RPM up until its redline. With a quick downshift, passing is done with ease. From a stop, there's a bit of lag, but it's not too bad. Overall, it's much more impressive than the 2.0 Tigershark. Fuel economy for this model with the manual transmission is 29 city, and 39 highway. It should be noted that a last-minute confirmation was made that there will be an Aero model that will get "at least" 41 MPG according to Dodge. 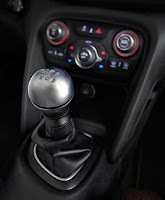 The six-speed manual transmission's throws were a bit long and the shifter itself was tall with a big silver knob that I believe it plastic. When I shifted, my elbow would hit the seat bolster, so I either had to make a non-natural adjustment of my arm, or it would whack the seat. Shifter feel is average; I did seem to have a bit of trouble making the 3-2 downshift. 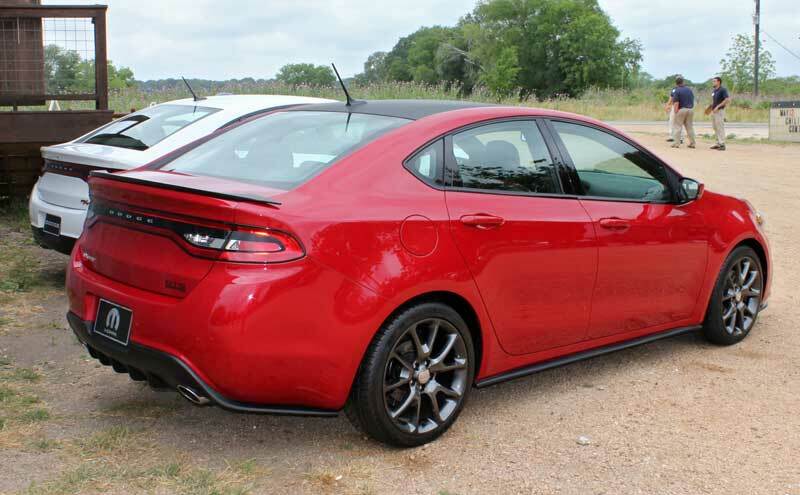 Although it might not be my favorite shifter on earth, kudos Dodge for offering a manual transmission as standard equipment on all of the Dart models. Our SXT tester had an all-cloth interior without some of the stitching and upper soft touch dash bits found on the Limited. It still had an attractive, two-tone motif, and I found both cars very comfortable as both a driver and a passenger—more so than the 2012 Ford Focus we recently reviewed. Then again, Dodge said that the EPA technically considers the Dart a midsize due to the large amount of room on the interior (EPA class designations go on interior volume. It's wonky, but that's the way it is). The SXT also features 17" alloy wheels and power everything standard. One of the other journalists (and a self-professed Mopar enthusiast) commented on how he thought the Dart was reminiscent of the Neon in terms of handling—definitely a complement—because if there was one performance attribute the Neon was known for it was handling. And although I haven't spent too much time in Neons of yore, I will say that Dart's chassis is a willing participant in back-road fun, no matter the trim level. Part of that can be attributed to the four wheel independent suspension, the disc brakes, and the great steering feel. Combine this with a great interior (a Wards Automotive award winner, in fact), and you've suddenly got another very attractive compact contender on the market. The 2013 Dodge Dart with some Mopar goodies. It should be noted that the higher-performance Dart R/T will be out in the third quarter of 2012 and will incorporate more sporty bits into the vehicle. This includes the most powerful engine officially announced thus far, the 2.4-liter Tigershark making 184 hp and 171 ft./lbs. of twist. An R/T model can be seen below. They were not available for test drives. 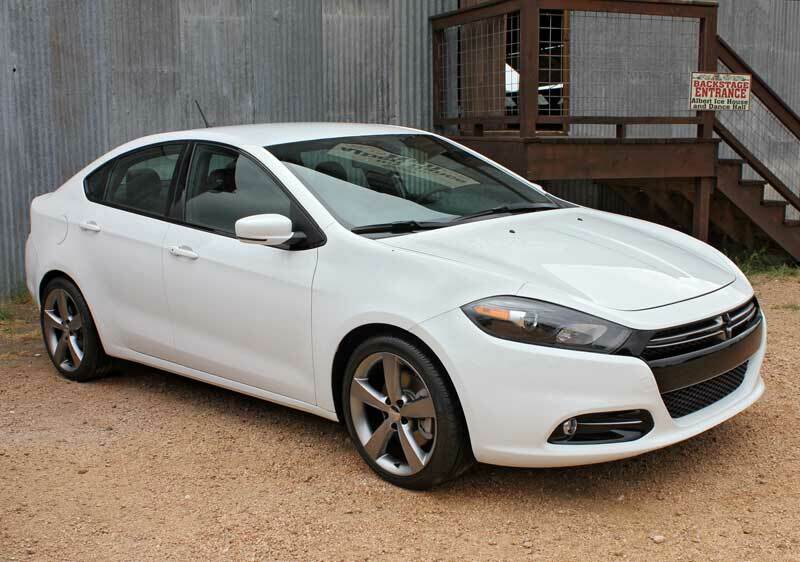 Above, is a Dart with some Mopar accessories, a carbon-fiber hood, and attractive Hyper Black alloy wheels. Full disclosure: Dodge paid for my plane ticket, hotel, and meals for this event. Sounds like all that's missing is a hatchback. Glad to see you got the invite to Austin. I heard Chrysler flew a lot of bloggers down there recently, some of which aren't even automotive bloggers. All that leaves me wondering about your review is the price difference between the 2.0 and the turbo 1.4. 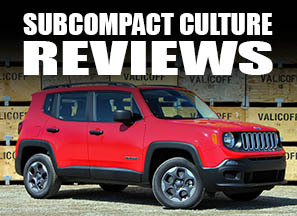 Rarely does the more powerful trim get better fuel economy. However, with no horsepower difference, the turbo is going to have to be close to the price of the N/A model or I predict they won't be selling very many. The average consumer has no idea what torque does. All they're going to see is 160hp vs 160hp. I don't think 3 highway MPGs are going to sway anyone either way. I LOVE the outside look of the car. The interior looks reminiscent of that typical cheap American look, unfortunately. If the American car industry wants to grab people's attention and sales, especially from those of us who buy Japanese cars, get the interiors upgraded! @Tony: Two-door sedans/3-door hatchbacks are dead. It's always easier to sell someone on more doors than fewer. The Alfa Giulietta has hidden rear door handles (well hidden, not like those clunky things on the Sonic) and I don't see why those can't carry straight across.